GOLDEN EAGLE, a 1987 54' Ocean Alexander is a very well maintained, 3 stateroom Cockpit Motor Yacht and is the only one of this model offered for sale on the East Coast. She is powered by twin 410HP 671TI Detroit Diesels with approximately 1,900 hours after an in-frame overhaul, 3,650 total hours, and they have been recently serviced. Motors have been well maintained with all engine hoses replaced, both aftercoolers removed, inspected and cleaned. Fully equipped for extended fuel range capacities, GOLDEN EAGLE can be easily converted for an even longer range. She also has an Offshore Marine Laboratories 1000GPD Water Maker and stabilized with Gyro-Gale Quadra-Fin Air Operated Stabilizer System. Over the years, GOLDEN EAGLE had extensive upgrades including New Northern Lights 16kw Genset, Quadra Fin Stabilizers, Side Power 155TC bow thruster, dual Racors with bypass installed, Algae-X fuel polishers, fuel transfer systems, Dual Cruising Freezers and an Inverter system. She also has had almost all appliances replaced, upgraded electronics and navigation equipment, granite countertops for the galley and both heads and added the powerful Sidepower 250 TC stern thruster. GOLDEN EAGLE is in very good operational condition, very reliable and used by the owner to single-handedly cruise from the Bahamas to Miami a few times a year for supplies. 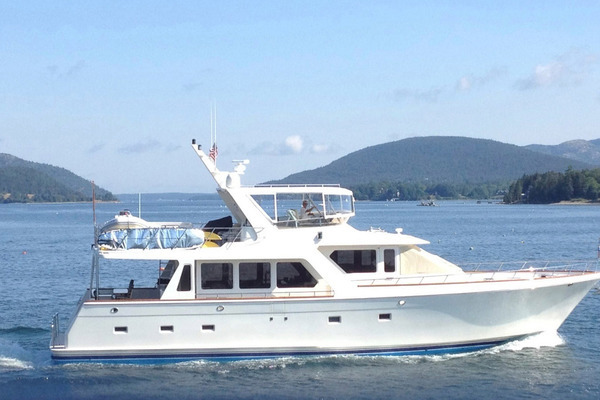 With a hinged radar mast, 22’ up and 15’6” down, she is perfect to cruise “The Great Loop”! Owner will consider a trade of a 30’-35’ Express Model and all reasonable offers!! 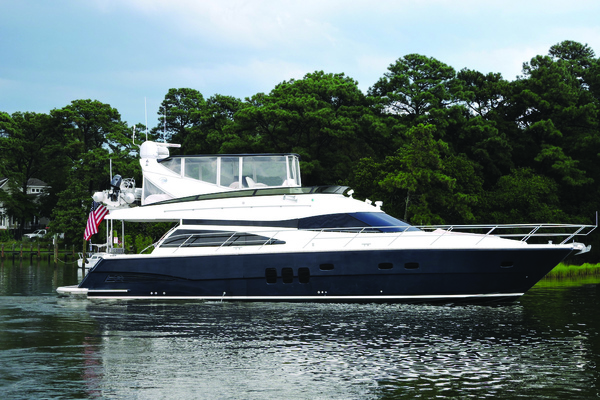 West Florida Yachts would love to guide you through a personal showing of this 54' Ocean Alexander Cockpit M/Y 1987. 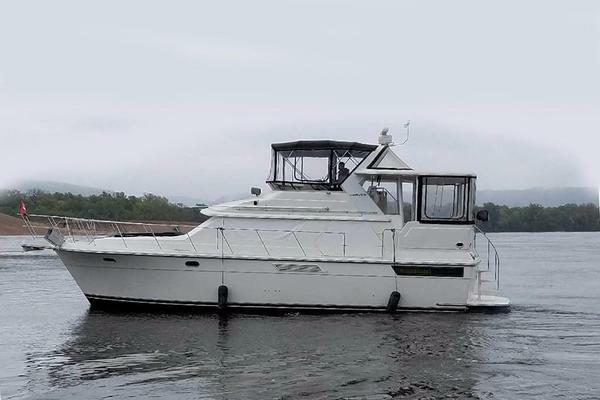 This yacht for sale is located in Bahamas / Florida Bahamas and priced at $199,500. For a showing please contact us by filling out the form on this page and we will get back to you shortly! Entry onto the GOLDEN EAGLE is through the starboard side door into the galley area. Here you have the first look of the beautiful craftsmanship that went into her build with Teak cabinetry throughout. Starboard side is a Hi-Low inlaid teak dinette with 4 teak chairs and plenty of storage. To port is the full size galley with gorgeous black granite countertops, newer appliances and also the lower helm station. Next to the lower helm and down three steps take you to the VIP Stateroom located forward, which features an island queen bed, walk-in closet, port and starboard teak storage drawers, skylight with screen. The VIP Stateroom has its own private head with black granite countertops, parquet flooring and a large shower stall. The large engine room is accessed through the VIP stateroom stairs, and has enough room to easily work on the motors and all of the mechanical equipment. Going aft from the galley down three steps is the guest stateroom to port which offers over and under bunk beds and teak storage drawers. Across from the guest stateroom is a utility locker with a combination washer and dryer. Moving aft is the Guest and Master head to starboard with separate entrances, granite countertops and separate stall shower. The gorgeous full beam master stateroom has a walk around king size bed with teak closet forward, and a plethora of storage on both sides of the berth. Back in the galley going aft and up three steps takes you into the full beam bright and airy salon with a queen size sofa/sleeper to port and two wicker barrel chairs to starboard. The beautiful entertainment center is forward equipped with flat screen 37” TV, DVD and satellite system. You can access the bow from either side of the salon and going up the teak stairway by the entertainment center you will be on the fully enclosed flybridge with seating for 10. Going aft through the dual sliding teak and glass doors is the generous upper aft cockpit to enjoy the evening breeze or have your morning coffee. Down the three step ladder is the lower aft cockpit to drop a line while at anchor and the lazarette storage. You can access the swim platform through the transom door and it is equipped with a folding swim ladder.